The constant process of evolution in the poultry industry has resulted in levels of production that were inconceivable a few years ago. But these achievements are linked to a good efficiency in feed utilisation, which may be affected by disturbances such as bacterial enteritis or coccidiosis symptoms. Example of necrotic enteritis lesions in the medium intestine. It is therefore essential to achieve optimum gut health in order to harness the full productive potential brought about by genetic and technological improvements. But what do we mean when we talk about gut health? In most Asian countries, anticoccidial drugs are still widely used against coccidiosis in chickens, both in broilers but surprisingly also in long life birds such as native/colour chickens, layers and on some breeder farms. In this post, we will describe the use of a live attenuated vaccine against coccidiosis in chickens on an open-house breeder farm during the dry season in the Philippines. Example of traditional Asian bamboo slatted house. With the increasing problems of drug-resistance and pressure from consumers to ban drugs from animal feeds, there is a pressing need to move away from chemotherapeutic control towards vaccination against coccidiosis in chickens. Furthermore, vaccines are the only products that are able to generate a good level of specific immunity from the very beginning. Using Eimeria vaccines while reducing antibiotic use: A paradox? One of the biggest challenges in poultry production nowadays is to learn how to raise chickens without antibiotics and coccidiostats. This will automatically result in an increased need to rely on prevention strategies, especially Eimeria vaccines. But are Eimeria vaccines and antibiotic reduction incompatible or can they coexist? Coccidiosis caused by Eimeria parasites is one of the most common and widespread diseases in modern commercial poultry systems. What’s the real cost of Coccidiosis? The global cost of coccidiosis has been recently estimated to be over $3 billion per annum. Continue reading Using Eimeria vaccines while reducing antibiotic use: A paradox? Shattering myths about coccidiosis in chickens: is coccidiosis control possible by means of 100% vaccination in broilers? Nowadays coccidiostats are still widely used in broilers for the prevention of coccidiosis in chickens. On the other hand, 100% coccidiosis vaccination is not questioned in the case of breeders. But, why should we reject it in the case of broilers? And more importantly, is 100% coccidiosis control possible in broilers by means of a vaccine? Without any doubt, the industry does question 100% coccidiosis vaccination in broilers. So far, this 100% vaccination has been limited to some niche productions, such as free-range, organic and native/coloured chickens in the case of Asian countries. These productions have adopted vaccination against coccidiosis in a natural way, without any problems or any changes in the way of production. In standard broilers, it would be the opposite. Continue reading Shattering myths about coccidiosis in chickens: is coccidiosis control possible by means of 100% vaccination in broilers? The global cost of coccidiosis has been recently estimated to be >$3 billion per annum. This cost calculation is based on direct production losses and indirect costs for prevention measures. However, most of this financial loss comes from an increased feed conversion ratio (FCR) and decreased weight gain (Williams, 1999). In addition, clinical disease – in broilers mainly caused by Eimeria tenella – leads to increased mortality. Finally, Eimeria is also one of the most important predisposing factors for bacterial enteritis. Anticoccidial feed additives or anticoccidial drugs have been and still are the most widely used prevention tool in broilers. These products have many merits but the two main issues associated with their use are (i) reduced sensitivity of Eimeria parasites when a certain product is used for too long or too often and (ii) cross resistance between certain compounds (Marien et al., 2007). In the first part of this post, we saw that the joint administration of two vaccines for coccidiosis in chickens -EVALON® and HIPRACOX®- together with probiotics is feasible with a vaccination spray device that ensures accuracy and precision -Hipraspray® device-. In this second part, we assess the added protective effect of the synbiotic PoultryStar® in broilers vaccinated against coccidiosis with HIPRACOX® and challenged with a coccidia species mixture at day 15. Optimal gut health represents the basis for the ever-increasing need to reduce antibiotic & anticoccidial use. 456 day-old male broilers of the ROSS 308 breed were housed for a 35-day grow-out in floor pens covered with wood shavings. Ventilation and heating were regulated automatically. Pelleted feed and water were provided ad libitum. The commercial feed contained neither antimicrobials nor anticoccidial additives. The animals were divided into 3 treatment groups of 152 animals with 8 replicates per group (see Table 1). Is Eimeria tenella the only species diagnosed in poultry coccidiosis? On several occasions in this blog, we have talked about coccidiosis diagnosis, and we recently focused on the lesion scoring technique, which is certainly the most widely used method for diagnosing Eimeria tenella in the field. Let us carry out a brief review of all the posts published on this subject with a view to understanding how to make the most of each technique. Oocysts per gram of faeces (OPG) count and morphological identification are often wrongfully considered the gold standard technique for coccidiosis diagnosis. Wrongfully because the presence of oocysts cannot be interpreted as an outbreak of coccidiosis, as Eimeria oocysts are ubiquitous. Therefore, the significance of this finding must be weighed against the level of oocysts/gram first and then other indicators of disease, such as the presence of clinical signs in live animals, as well as macro- and microscopic lesions in the intestine at necropsy. Continue reading Is Eimeria tenella the only species diagnosed in poultry coccidiosis? Continue reading What should we ask of a vaccine against Eimeria? Eimeria species involved in avian coccidiosis: Who claims 7 and who claims 9? Avian coccidiosis is a costly intestinal disease caused by parasites of the Phylum Apicomplexa, genus Eimeria, which frequently affect poultry. Apart from the three best known Eimeria spp. (Eimeria acervulina, Eimeria maxima and Eimeria tenella), other species can also affect chickens, and their appearance is mostly related to the category of birds under consideration: long or short-lived birds. In this post we will review the most important posts published so far on this subject and we will try to shatter a myth: do Eimeria mivati and Eimeria hagani really exist? Eimeria tenella grade 4 lesion: caecal wall greatly distended with blood or large caseous cores; faecal debris lacking or included in cores (according to Johnson and Reid, 1970). Chickens are susceptible to seven Eimeria species: Eimeria acervulina, Eimeria brunetti, Eimeria maxima, Eimeria mitis, Eimeria necatrix, Eimeria praecox and Eimeria tenella. Very often this is the start of many articles about coccidiosis, however many argue that another two species should be included in this list. 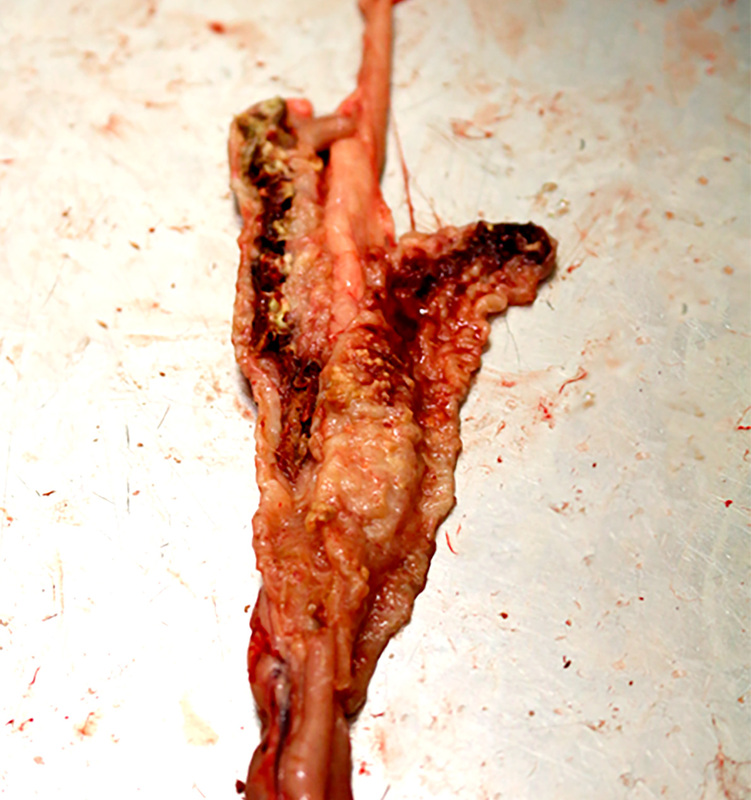 Continue reading Eimeria species involved in avian coccidiosis: Who claims 7 and who claims 9? When we talk about coccidiosis in chickens, we should not forget to mention gut health, as whatever provokes a disruption of gut balance can also influence this disease or the other way around. In view of this strict interconnection and taking into account the fact that optimal gut health represents the basis for the ever-increasing need to reduce antibiotic & anticoccidial use, it is easy to understand that nowadays the “Silver Bullet” would be to find the perfect combination between coccidiosis vaccines & feed additives intended to maintain gut balance, such as probiotics. This combination should guarantee the best coccidiosis prevention through vaccines, together with optimal gut health and competitive productive results. 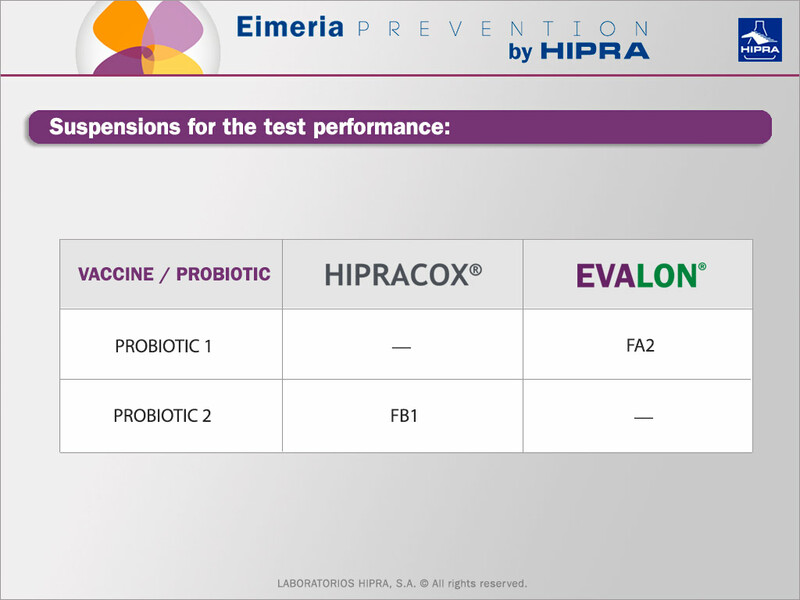 Before evaluating whether the combination of vaccines for coccidiosis in chickens plus probiotics is beneficial from the intestinal health point of view, we had to investigate the possibility of administering EVALON® and HIPRACOX® vaccines, each together with a different probiotic, using Hipraspray®.